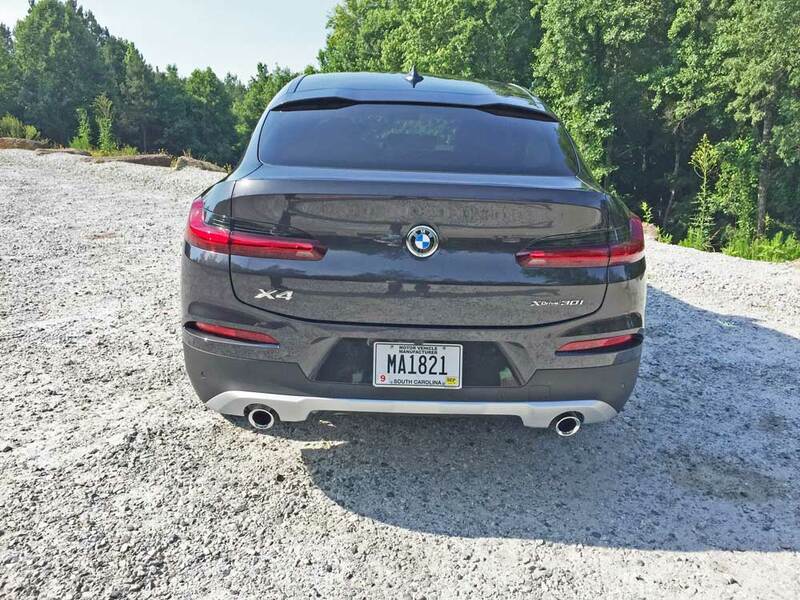 ?2018 BMW X4 xDrive 30i SAV? The second generation BMW X4 launches for the 2019 model year with two available models ? the BMW X4 M40i and the BMW X4 xDrive 30i. Both models serve up an eye-catching and sportier persona. The sportier drive characteristics come thanks to wider tracks, a lower center of gravity, the latest generation suspension componentry and improved aerodynamics. Both are bigger and better. An increase of approximately 3 inches in exterior length to 187.5 inches, 2.1 inches added to the wheelbase (now 112.7 inches), an extra 1.4 inches of width (75 inches) and an approximately 0.1 inch drop in height (to 63.8 inches) give the all-new BMW X4?s dynamically stretched proportions. Short overhangs and powerfully formed, subtly hexagonal wheel arches emphasize the nearly perfectly balanced 50:50 distribution of weight between the front and rear axle. Within BMW?s ranks, there are SUVs, SAVs and SACs., the acronym SAV (for Sports Activity Vehicles) is applied as a reference to their SUV-type vehicles. In The German vehicle manufacturer officially added the SAC acronym for Sports Activity Coupe to the mix in the summer of 2008, in the form of the all-new BMW X6, a vehicle that essentially redefined the concept of a traditional coupe with five doors, four sculpted seats, four doors, an elevated ride height and a surprisingly impressive cargo capability. The X6 blended the handling agility of a BMW coupe with the versatility of a BMW SAV in BMW?s newly appointed SAC form. It came in three models: the BMW X6 xDrive35i, the BMW X6 xDrive 50i and the ActiveHybrid X6. The numeric designations referred to the engine variants that powered the specific models. 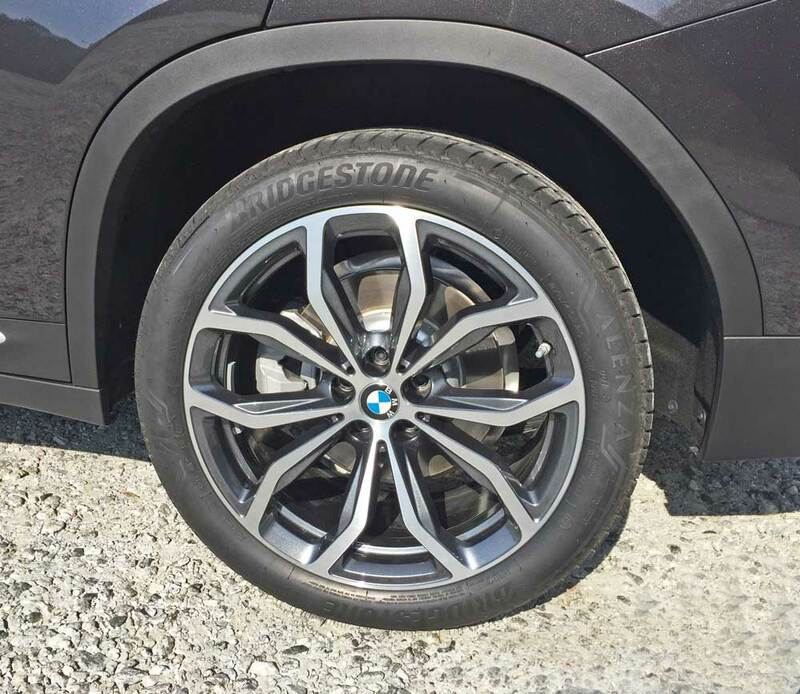 Enter the 2019 BMW X4 xDrive. When the BMW X6 was first launched, the necessity of such a vehicle was questioned by many, and then, when the M version of the X6 came along, that move was questioned as well. The introduction of the BMW X4 M40i also raised some eyebrows. After all, who really needs an M version of the X4? And for that matter, who really needs an X4. Well, folks, in the automotive industry, need aren?t always the operative word ? want or desire more often becomes the deciding factor of a vehicles sales success. The X6M became a big success, and it?s quite likely that the BMW X4 M40i will share that fate, and in reality, the BMW X4 xDrive 30i should also enjoy a high level of popularity. The BMW X4 provides a taste of the Sports Activity Coupe concept in the premium mid-size segment. As with its larger sibling, the BMW X6, the BMW X4 offers a unique and unmistakable road presence. The appeal of the Sports Activity Coupe concept has been evidenced by the sales success of the X6 models. The new 2019 BMW X4 M40i will reign as the top model in the popular X4 Series, setting a new benchmark in the middle class of the Sports Activity Coupe segment, but the BMW xDrive 30i is certainly no slouch in the performance arena. The motive force for the BMW xDrive 30i comes from a 2.0-liter, DOHC, 16-valve BMW TwinPower turbo inline 4-cylinder longitudinally mounted front engine with Double-VANOS, Valvetronic and high-precision direct injection that delivers 248 horsepower in a range from 5,700 to 6,500 rpm, while also developing 258 pound feet of torque from 1,450 to 4,800 rpm. The driving energy is geared to BMW?s M xDrive all-wheel-drive system via an eight-speed Sport automatic transmission with Sport and manual shift modes and steering wheel mounted paddle shifters and Launch Control. Starting price is $50,450. 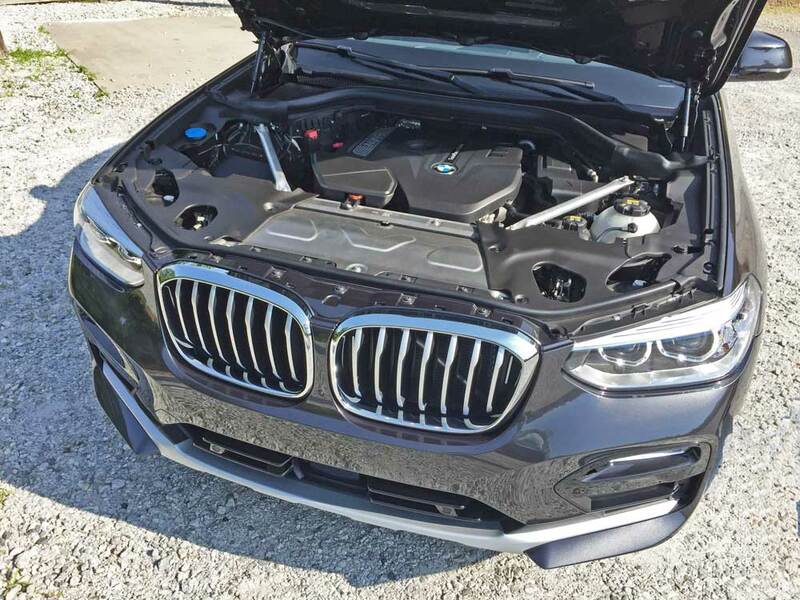 The X4 M40i draws its power from a 3.0-liter, DOHC, 24-valve inline 6-cylinder M Performance TwinPower Turbocharged engine with High Precision Direct Injection System, Valvetronic and Double VANOS. This potent engine delivers 355 horsepower in a range from 5,500 to 6,500 rpm while producing 365 pound feet of torque from 1,520 to 4,800 rpm. The engine is positioned longitudinally up front, and its energy reaches all four wheels with BMW?s intelligent AWD system, metered through an eight-speed Steptronic sports automatic transmission with steering wheel mounted paddle shifters and a standard launch control feature. Pricing begins at $60,450. This latest iteration X4 Sports Activity Coupe delivers a unique expression of ?The Ultimate Driving Machine? mantra projecting its own personality and character. Measuring 187.5 inches in length, it cuts an impressive figure with its balanced proportions and distinctive image. Large air intakes positioned at the outer edges of the front fascia and precise front apron character lines display a muscular persona, lowering its visual centre of gravity more closely to the road while showcasing a sharper dynamic. This effect is further enhanced by LED foglights positioned beneath the signature twin round headlights, defining the familiar face of every BMW X model. In profile, the X4?s coupe-like roofline reaches its highest point over the front seats, reflecting the traditional driver focus of all BMWs, before sloping down gently toward the tailgate?s trailing edge. 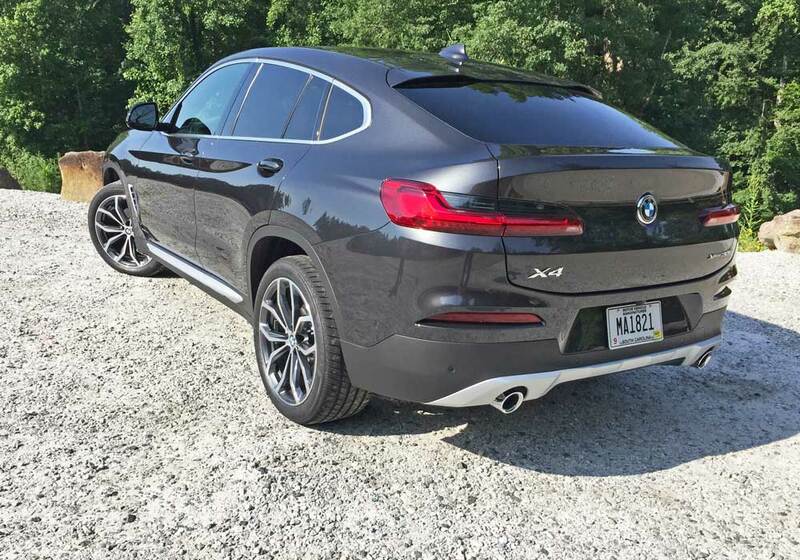 The stretched lines underscore the X4 ?s sporting coupe image. The X4?s unique design is further reinforced by the fresh interpretation of the signature swage line that runs along the flanks of BMW models. which, for the first time, is split into two. The first section rises gracefully from the front wheel arches to the rear door handles, highlighting the vehicle?s dynamic ability, while the second section accentuates the powerfully sculpted rear fenders. The contoured ?C?-pillars ? combined with the muscular shoulders ? represent a continuation of the theme, as does the broad and low-set rear end, designed to remind the driver and passengers of the performance potential offered even before they climb aboard. Entering the now roomier cabin, one instantly notes the premium ambience. Controls and switchgear are sensibly arranged and set off by trimmed down trim finishers. The instrument panel is set low and the slightly elevated seating position affords drivers an enhanced view of the road. The cockpit layout is driver focused helping to always create a sporty driving experience. Redesigned sports seats with boldly contoured side bolsters provide excellent lateral support particularly in spirited handling exercises. The surfaces of the instrument panel and door paneling merge smoothly into one another, while the X logos embossed into the electroplated surfaces of the front and rear doors provide eye-catching details. The ambient lighting, adding extra light sources around the center console and instrument panel, in the door paneling and in the foot wells, enhances the overall sense of wellbeing. The lighting mood may be adjusted to suit the driver?s mood thanks to a choice of six colors. Large storage trays, roomy door pockets, cup holders and various compartments add to the versatility and functionality of the new X4. Standard fare now includes: Navigation Professional with a10.25-inch touchscreen display, iDrive Touch Controller, and real-time traffic and parking information; a Navigation Professional with 10.25-inch touchscreen display, iDrive Touch Controller, and real-time traffic and parking information; a 75 percent larger, segment leading multicolor Head-Up display; Active Guard ? With Frontal Collision Warning, Automatic City Collision Mitigation and Braking with Daytime Pedestrian Detection, and Speed Limit Information; Active Protection ? Pre and post-crash safety systems that identify critical situations and act before, during, and after an incident; xLine design with Sport Seats and 19-inch wheels; a new Panoramic moonroof for increased rear passenger comfort; and a 3-Zone Climate Control. 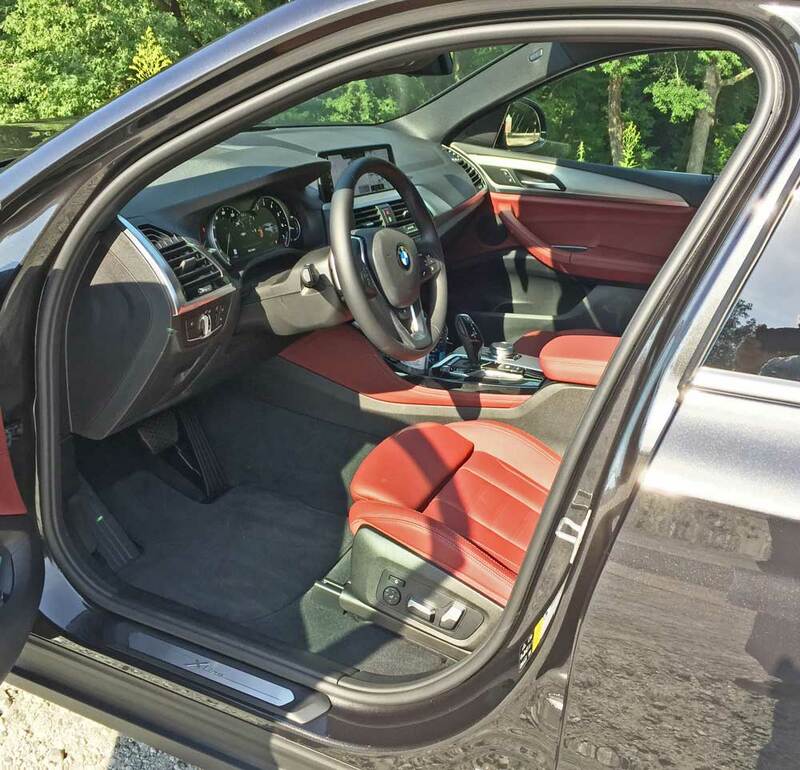 My test 2019 BMW X4 was the xDrive30i version, with a Dark Graphite metallic exterior finish and a Tacora Red Vernasca leather interior with charcoal accents. The base price was set at $50,450., which rose to $57,895. After adding optional features, which included: the metallic paint and leather interior, the Convenience Package, Driving Assistance Package, Parking Assistance Package, the Premium Package and Destination Charge. 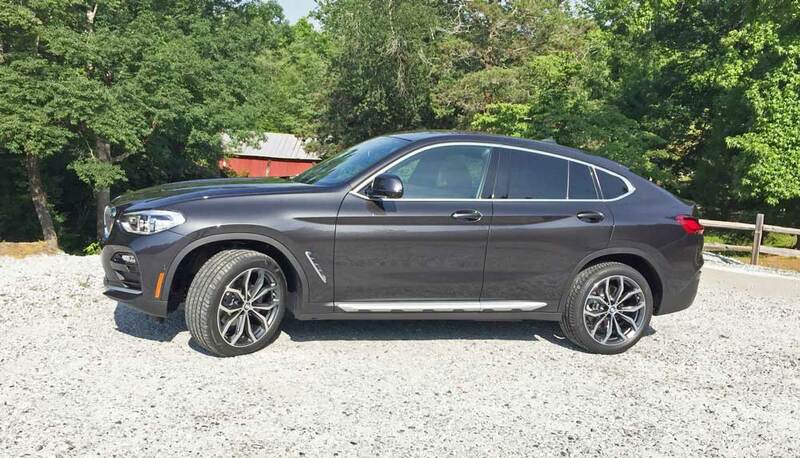 I initially pondered why BMW originally built the X6, deducing that most likely because they could. Was there a definitive need for such a vehicle at the time? Perhaps not. But it?s highly popular and has met with tremendous sales success. The X6?s actual execution was and is without a doubt, quite well done, resulting an exceptionally nice SAC that performed admirably in every regard. So, it goes almost without saying that the production of the smaller, more affordable BMW X4 xDrive was a ?no brainer?. 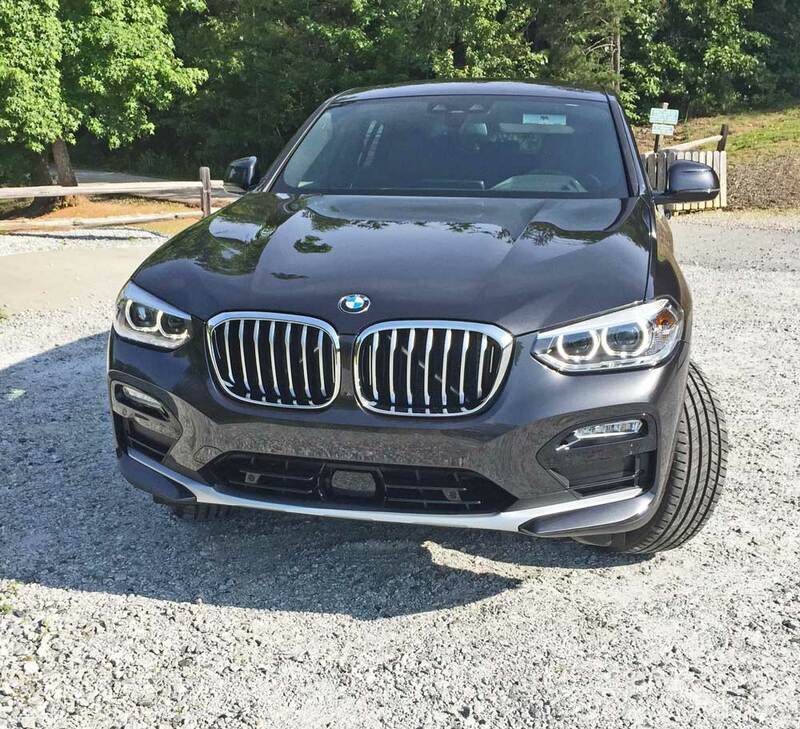 The X4?s acceleration, is instantaneous and plentiful — even with the smaller 2.0-liter powerplant ? it?s indeed definitely more than satisfying. The ride quality is comfortable but on the firm side, which contributes to its stability. The technology level is mind boggling, but unless driven to extreme levels, much of the technology will probably never come into play ? and even if it does, the driver and vehicle occupants will probably never really be aware of it. The rearward visibility is quite limited through the rear glass and entry into the driver?s seat necessitated folding forward to avoid hitting one?s head in order to clear the radically curved roofline. On the plus side however, controls and switchgear, once inside are well placed for optimum ease of use, and the seating is not only comfortable, but very supportive as well. 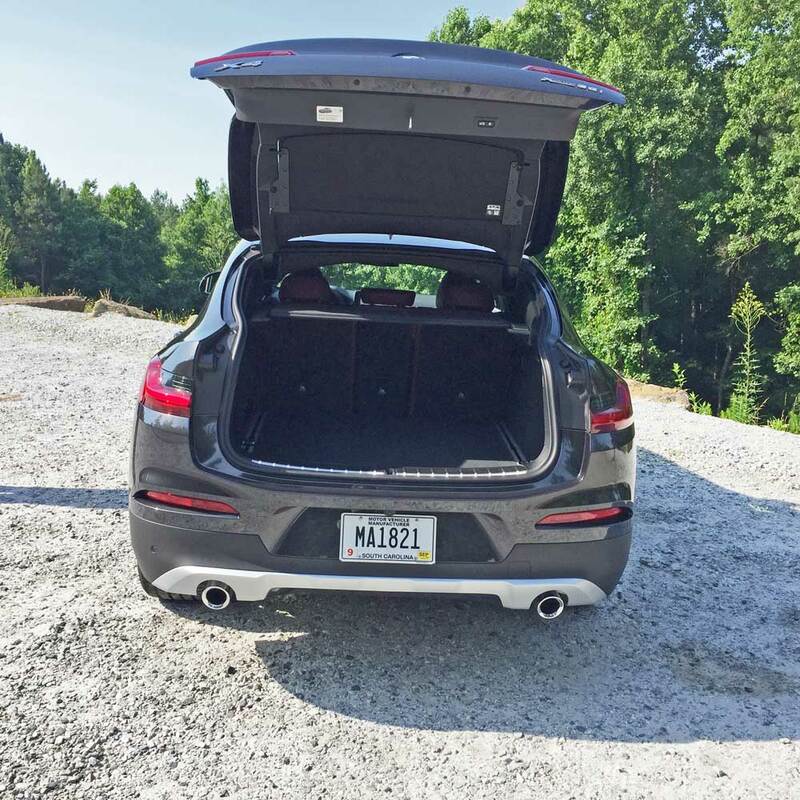 The damped glovebox and the folding and removable rear cargo cover both offer nice touches and added convenience and functionality. The xDrive ? BMW?s intelligent all-wheel-drive system with Performance Control and BMW?s EfficientDynamics ECO PRO mode and coasting function that reduces fuel consumption are both highly desirable features. Given what some perceive to be a controversial design form much like its larger X6 sibling, the lower price tag of the X4 is sure to attract a new wave of consumers. 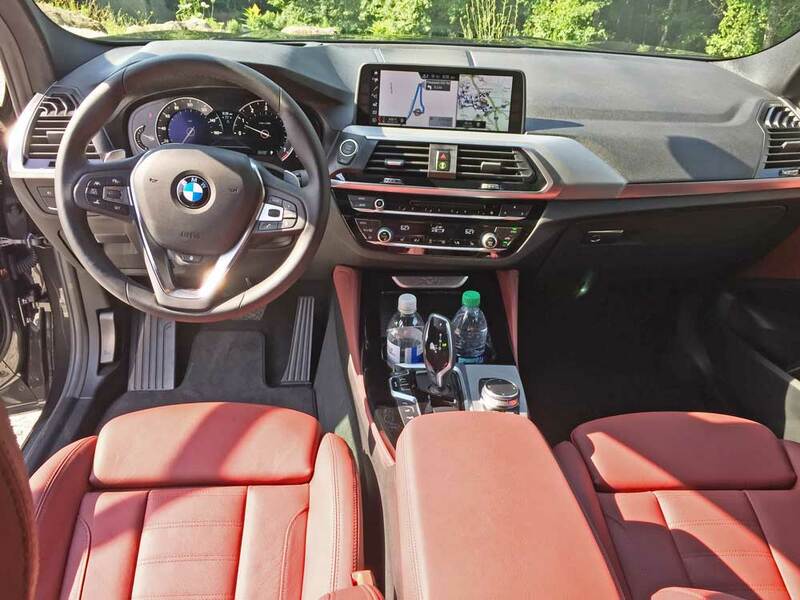 Bottom line, the bold exterior styling, though not for everyone, gives way to the elegant and comfortable interior design, and the performance characteristics are exceptionally satisfying all-around, and the X4 is certainly more affordable. 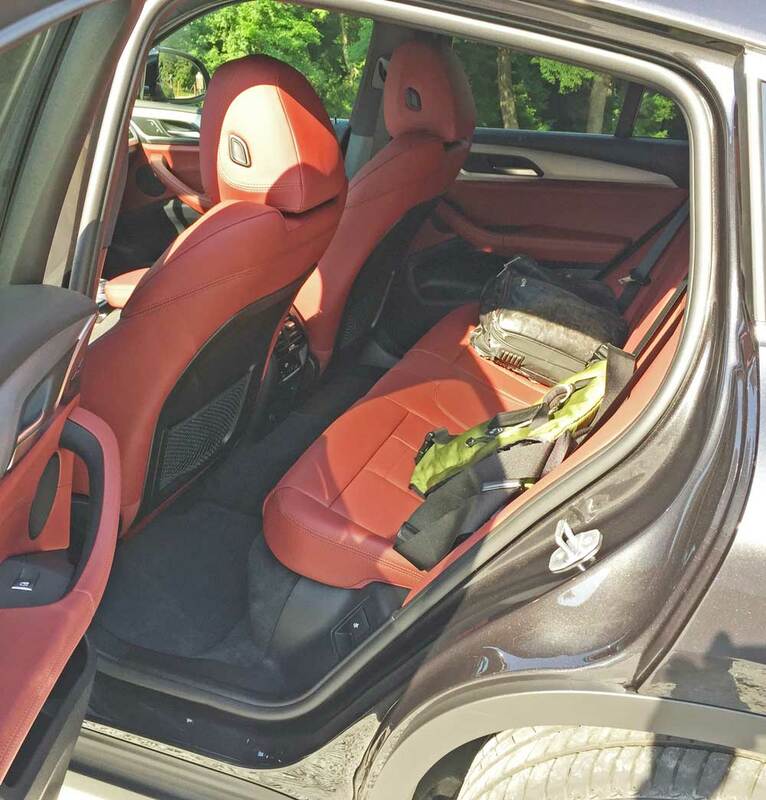 So, bottom line, if you liked the X6 SAC, but preferred something more manageable in terms of size and dollars spent in acquisition, you?re sure to love either model of the BMW X4 xDrive SAC. Engine Type and Size: 2.0-liter, DOHC, 16-valve BMW TwinPower turbo inline 4-cylinder with Double-VANOS, Valvetronic and high-precision direct injection. Transmission: Eight-speed Sport automatic with Sport and manual shift modes and steering wheel mounted paddle shifters and Launch Control. Suspension: Front -Double-joint spring strut axle with lightweight aluminum anti-roll bar. Rear ? Five link rear axle with lightweight aluminum anti-roll bar. Brakes: Power-assisted four-wheel discs with ABS, DSC, DTC, ADB-X, CBC, DBC, Start-off Assistant, and Hill Descent Control. Tires: Pirelli Cinturato P7 ? 245/50 R19 105H M&S mounted on 5-?V?-spoke silver alloy wheels.